Did you know that people who drink soda have an 80% increased risk of developing Type 2 diabetes? Or that 20 minutes after you drink soda your blood sugar levels spike causing an insulin burst. And your body responds to this burst of insulin by turning sugar into fat. While soda consumption has decreased recently in the United States, many of us are still consuming soda, diet or regular, on a daily basis and we certainly aren’t benefiting our health by doing so. Surely you’ve heard the negatives about soda such as it being devoid of any nutritional value, it’s nothing but sugar water or that it can lead to a variety of serious health issues like obesity and diabetes. Guess what – they are all true. And, for you diet soda drinkers, just because it says diet on the can doesn’t mean it’s good for you. 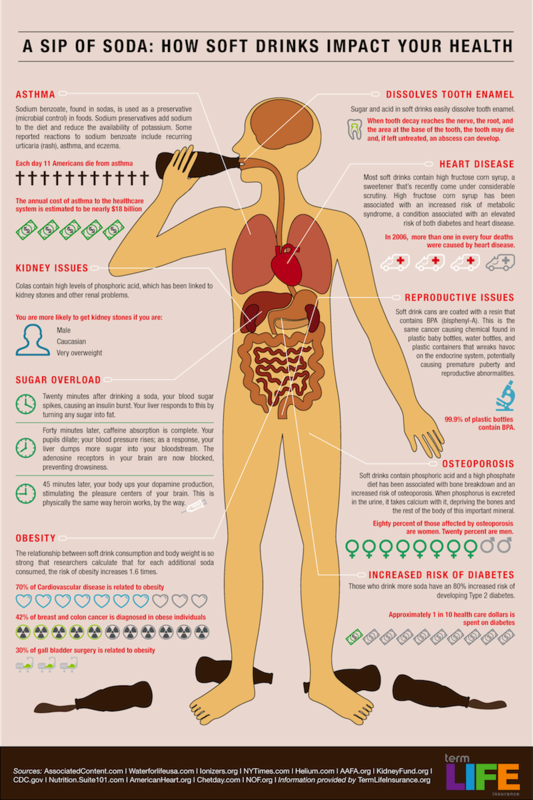 Check out the infographic below to learn even more about the harmful effects that soda has on your health. The sugar and acid in soda dissolves tooth enamel. There is a strong correlation between soft drink consumption and body weight that researchers calculate that for each additional soda consumed, the risk of obesity increases 1.6 times. Soft drinks contain phosphoric acid which has been linked to bone breakdown and an increased risk of osteoporosis. Diets high in phosphoric acid have also been linked to kidney stones and other renal problems. Instead of indulging in your favorite sugary soft drink, try drinking more water. For more flavor, add lemon or limes to enhance the flavor of the water without adding calories, sugars or any of the other negative health impacts that you can incur from soda. Infographic courtesy of Term Life Insurance .